Granted, snow removal usually isn't something to write The Ethicist about, but like any outdoor activity that impacts the public and your neighbors, there are legitimate questions of etiquette and propriety at stake. Not surprisingly, there also might be some laws that can make these decisions for you. 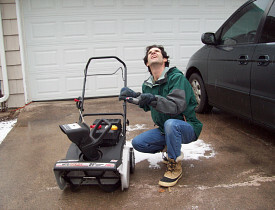 The basics of snow removal apply pretty much equally whether you're moving snow with a cheap plastic shovel or a two-stage snowblower, but if you're in the latter group, there are a few additional matters of conduct to consider in this timeless annual ritual. Don't throw your snow onto your neighbors' property (especially the driveway or walkways). Try not to fire up the noisy beast at the crack of dawn or late at night (although this can't be avoided sometimes). If your neighbors aren't as able-bodied as you, it might be nice to offer to clear their driveway (or at least their sidewalk) with your snowblower. This brings up a particular snowblower's dilemma: Where do you stop clearing the sidewalk? You're probably legally required to clear the sidewalk within your property boundaries, but many snowblower folks feel compelled by moral or social pressures to keep going, clearing the sidewalk in front of the next-door neighbors' houses and often beyond. You can't clear the whole neighborhood, so where do you stop without offending? I might sound like I'm crazy, but the Chicago Tribune ran an article devoted solely to this very subject, the final message of which is: It's neighborly to do what you can, but you have to be willing to set boundaries. Just as the laws of nature dictate when it snows, the laws of city hall dictate when you have to remove it. Most locales have laws governing snow removal; check your city's website to find out your obligations. For example, Denverites have 24 hours after a storm to clear their driveways and sidewalks adjacent to their property (or call a Denver landscaper to do it; who has time to shovel before the morning rush?). Boston residents can be sued for damages resulting from ice and snow on their property. In terms of etiquette, it's a classic good neighbor move to clear your sidewalk promptly, and it seems callous not to. Furthermore, problems from not doing so often are long-lived as the trampled snow turns to hard-pack and ice, which linger far longer than the moisture on sidewalks that were cleared right away. I won't attempt to speak for the U.S. Postal Service, but I know that in my neighborhood, if the mail truck can't drive up close enough to a mailbox, those folks don't get their mail that day. And I'm certain it's the carrier's legal prerogative to make that call. The same rules apply for mail that's delivered on foot. As a question of etiquette, it's always a nice gesture to clear the area in front of grouped mailboxes, so everyone has easy access to their mail. If the plow hasn't come yet, is it OK to dump your snow into the street? The short answer is: not really. Of course, it would be silly to worry about adding a little snow to an unplowed street, but in the end it will probably create more work for you and possibly for your next-door neighbor. Because of how a snowplow works (see below), dumping your driveway snow into the street means that some of the snow inevitably will be plowed right back to you or to your neighbor. Dumping into the street creates more work for the plow, too. There's nothing worse than clearing your concrete driveway post-storm just in time to be "plowed in" by the city's snowplow barreling down the street. This perennial problem prompts thoughts of violent retribution by many a homeowner but the fact, is plows can't help it. On ordinary residential streets, snowplows have to push snow off to the right, which unfortunately is where your driveway happens to be. So the worst place to dump your own snow is the street on the left side (as you face the street) of the driveway. If your right-hand neighbor has a driveway close to yours, don't dump into the street on the right of your drive, either, lest you add to his burden. Best keep your snow on your own property so you won't have to move it twice; it will eventually water your landscape. Start praying for spring. Philip Schmidt is a Networx writer. Can a Handyman do Electrical Work?